Sensitive or more sensible skins are most difficult to deal with as because like any other skin types you cannot apply any product to it without the prior test on your any other body part. The best regimen that you can give to your skin is a good face moisturizer for sensitive skin that can keep your skin hydrated, nourished and protected throughout the day. These skin types are more prone to react negatively irrespective of the application of any new cosmetic product, environmental factors etc. and soon they start getting reddish, burn, itchy and get patchy. This happens because of the lack of sebum production from the skin which is the most vital element that fights against harmful chemicals causing skin issues. We understand the need and requirement of your special skin type that is why to make your way easy and comfortable for your skin care we have enlisted here top five moisturizer creams which will suit to your sensitive skin. Your special skin type i.e. sensitive skin needs a very special care for evergreen good looks. This requirement of your skin can be fulfilled with the Neutrogena Oil-Free Moisture as it is specially made keeping in mind the necessity of sensitive skin. It hydrates your skin deeply and makes it smooth, supple and soft. This also gives protection against harsh UV rays of the Sun. This moisturizer cream claims to provide complete protection and care of sensitive skin types. It can be used as a primer before makeup or can be used as alone also. It prevents clogging so that breakouts would not occur. Give day-night protection as you can apply it in your skin before bed also. As based on water formulation so provides deep hydration to your skin. Also, it gives gentle care and non-irritant so no issue of redness, burning and itching. 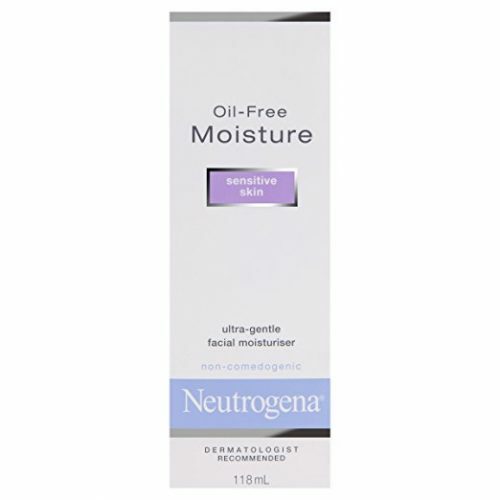 The Neutrogena moisturizer cream for sensitive skin is oil free so it doesn’t make your skin greasy or clogs your pores because of its light texture. Make your skin smooth and hydrated all the time. It gets absorbs in your skin very quickly so that the skin won’t get any reason to get dry or patchy. It doesn’t contain any alcohol, fragrance, and dyes which can cause harm to your most sensitive skin. Its primary ingredients include glycerin, water, petrolatum, ethylhexyl palmitate, soybean glycine soja sterols, cetyl alcohol, glyceryl stearate, C12-15 alkyl benzoate, PEG-100 stearate, diazolidinyl urea, sodium hydroxide, propylparaben, propylparaben, petrolatum etc. People who have more sensitive skin are benefited out of this moisturizer especially made for this skin type. It doesn’t make their skin greasy or oily as this light weighted moisturizer get absorbs in the skin instantly so that clogging would not occur causing breakout on the skin. It keeps your skin deeply hydrated. Free of artificial fragrance and dyes. It can be used alone or as a primer also before the makeup. This is a day-night cream. Give deep nourishment to the skin. Suitable for sensitive skin type. Pore clogging is the issue which is faced by few users. This moisturizer cream of Neutrogena is lightly weighted, based on hydrating formulation is most suitable one for those who have extremely sensitive skin. So we are recommending it to our readers who have sensitive skin. Aloe Infusion Body and Face Moisturizer are made up of natural organic ingredients so extremely safe and best for the sensitive as well as dry skin types. Its aloe vera infusion works as a natural healer which effectively fights with your skin issues and try to rejuvenate it so that your skin gets fresh, firmer and glowing. This moisturizer cream for sensitive skin claims to give deep nourishment to your skin with its Vitamin rich moisture intact. This is non-irritant so good for the skin which is acne prone as it will soothe your skin and will relive from irritation, burning or redness of the skin due to its sensitivity and acne. It helps in restoring the skin surface by promoting the growth of new skin cells. 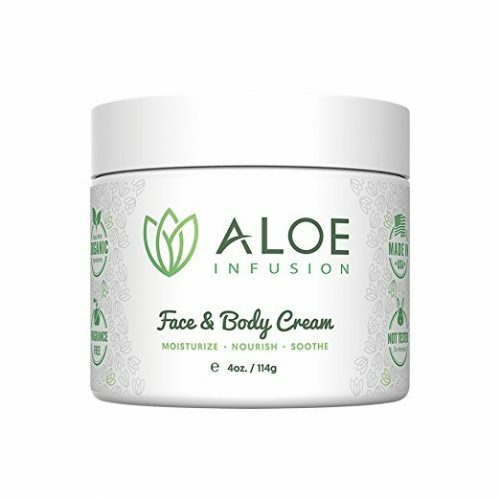 The Aloe Infusion Body and Face Moisturizer are prepared with 100% natural super-plants, organic seed and nut extracts that helps to rejuvenate the skin of your face and body by moisturizing it deeply. Aloe vera infusion works as a natural healer and hydrates your damaged skin very deeply so that it can get soothe, calm and relieved from inflammation. Its primary ingredients include Organic Green Tea Leaf, Organic Aloe Vera, Dandelion Root, Horsetail Herb, Reishi Mushroom, Carbomer, Diocide, EDTA, Colloidal Minerals, Organic Rosehip Seed Oil, Kukui Nut Oil, Almond Oil, Grapeseed Oil, Vitamin B5, Vitamin E, Vitamin C,Cocoa Butter, Carrageenan, Gotu Kola Herb, Horsetail Herb, Citric Acid etc. This moisturizer cream has worked amazingly on the acne problems of its users. Its users have great experience regarding its benefits and features. Almost in no time it absorbs in the skin and nourishes it deeply. Give you a fresh feeling by rejuvenating the skin texture and tone. Moisturizes the skin pores deeply. Helps in repairing damaged skin capillaries. Helpful in reducing stretch marks. Rich with an anti-inflammatory property. Not good as an under makeup cream. Some users have experienced the appearance of old scars on the skin. If you are sick and tired of your skin allergies and not getting rid of it then try this effective moisturizer which will heal your skin with its healthy organic ingredient and with the anti-inflammatory property. The best part of this moisturizes that it is also effective in treating eczema and stretch marks. 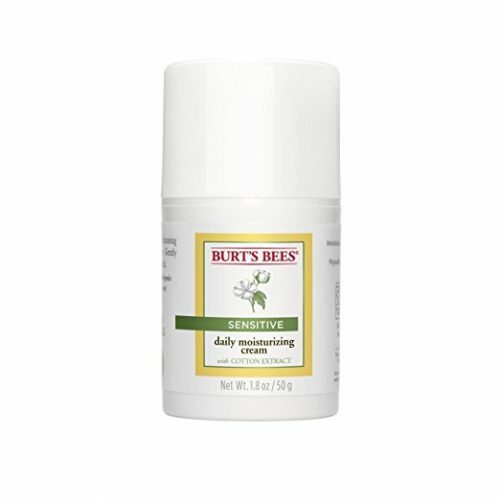 The Burt’s Bees Daily Face Moisturizer is one another one of the best moisturizers for sensitive skin types. This cream is formulated based on the need and requirement of your special skin types. It keeps your skin hydrated and moist so that breakout and irritation would not occur. Also, it helps in enhancing the beauty of your skin by exfoliating old skin cells and promoting the growth of fresh and healthy skin cells. This hypoallergenic face moisturizer claims to protect your sensitive skin from skin allergies and issues with its 99% natural ingredients. As it is free of artificial fragrance so that is one more added advantage to give protection against skin allergies like redness, itching, stinging, dryness, irritation etc. With its anti-inflammatory properties, it ensures a reduction in skin breakout and rashes. This sensitive skin moisturizer is quite safe to use as 99% of its ingredients are natural and it is free of fragrance. Its anti-inflammatory feature keeps your skin protected and ensures healthy soft and smoother skin with its regular use on the skin. Its primary ingredients include water, glycerin, sunflower seed oil, Gossypium herbaceum flower extract, Zea mays starch, beta vulgaris root extract, aloe barbadensis leaf juice, hydrolyzed jojoba esters, jojoba esters, glucose, citric acid, xanthan gum, potassium sorbate, sodium benzoate, sodium PCA, Phenoxyethanol, alcohol denat., sodium stearoyl lactylate, Butyrospermum parkii (shea) butter etc. This dermatologist-tested sensitive skin moisturizer keeps your skin soothe and moisturized with its aloe extract and other healthy natural ingredients of it. Your skin needs gentle care and that need of your skin can be fulfilled with this amazingly effective moisturizer. The users of this lotion are very much satisfied with it as because after regular usage of this lotion they notice a dramatic reduction in their skin breakouts and allergies instead they found a fresh looking younger skin. Good for daily usage for the sensitive skin. Nourishes the skin pores deeply. Keep the skin hydrated all the time. Keep the skin soft and cool. Helps in rejuvenating skin layers. It is dermatologist tested so very safer. This moisturizer is extremely light so need a very thick amount to keep skin moisturized. The best skin care regimen that you can give to your sensitive skin is by applying this gentle and soft care moisturizer. Apply this gentle moisturizer on your face and neck on the daily basis to keep your skin soothes, supple, healthy and irritant free. This green tea infused moisturizer is suitable for the sensitive skin types. The Vitamin and Catechin intact of this natural moisturizing cream protect your skin from dryness, sagging and other aging effects. As it is free of all toxic chemicals so you get refreshed healthy skin in a natural way. It ensures 4 times protection of your skin from aging issues and other sensitivity concerns with its peptides ingredients. It claims to keep your skin hydrated for as long as 72 hours so that in the lack of proper moisture and hydration breakout and dryness would not affect your face. It also ensures to maintain your skin elasticity, maintains skin firmness, and reduces dryness and wrinkle appearance. Sensitive skin is easily get affected by toxic chemicals. That is why it formulated with special ingredients which can give gentle care and protection to your special skin type. It is primarily made of healthy organic green tea which plays a vital role to keep your sensitive skin protected from allergies which are most likely to occur in this type of skin. Other necessary vitamins of this moisturizer keep your skin elastic, smooth, hydrated and nourished. Its primary ingredients include water, Camellia Sinensis Leaf Extract, Glycerin, Sodium Hyaluronate, Copper Tripeptide-1, sh-Decapeptide-7, Rh-Polypeptide-7, Glyceryl Stearate, Allantoin, Adansonia Digitata Seed Oil, Zanthoxylum Piperitum Fruit Extract, Usnea Barbata (Lichen) Extract, Adenosine, Arginine, Carbomer etc. 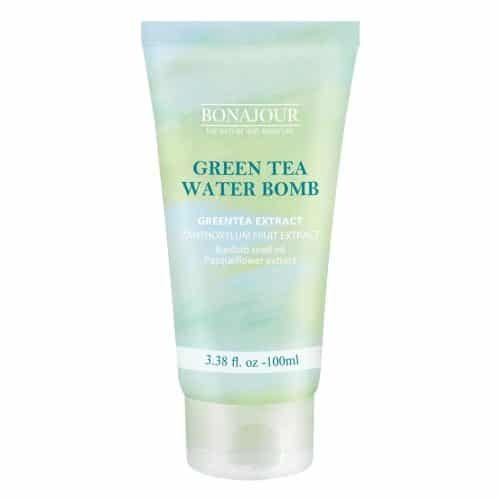 The BONAJOUR Green Tea Natural Moisturizing Cream for Dry and Sensitive Skin has won the heart of its users with its anti-allergen and anti-aging properties. People have found an effective reduction in their sensitive skin related issues like dryness, itching, redness etc. after its use. Also, it works effectively in the reduction of aging signs like wrinkles, spots, skin sagging and uneven texture. Free of fragrance and other toxic chemicals. Prevents skin’s redness and irritation. This moisturizer is a little bit heavy for the combination skin. By using this moisturizer cream you get dual benefit out of it. On one side it provides complete protection against inflammation or other skin allergies, on the other hand, it keeps your skin protected from the aging sign by keeping it nourished, hydrated and elastic. 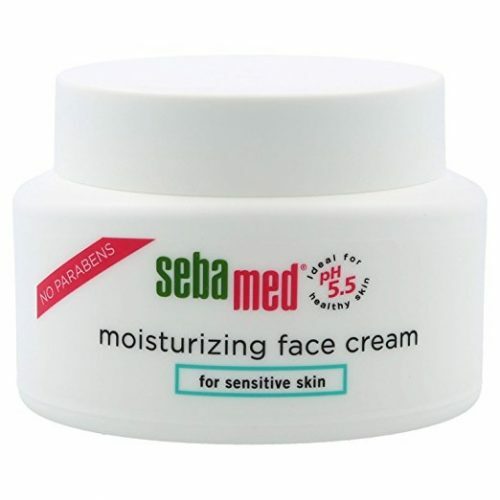 The Sebamed Moisturizing Face Cream is another best moisturizer for the sensitive skins. It carries pH 5.5 hypoallergenic ultra-hydrating ingredient that gives tender care to your special skin and heals it gently. It keeps your skin soft, hydrated and nourished throughout the day. As it is recommended by the dermatologists so quite safe also to use. This hypoallergenic moisturizer claims to prevent skin related allergies like redness, dryness, irritation, spots etc. with its gentle soothing effect on your skin. It is very mild and ultra-hydrating that helps in rejuvenating your skin cells by boosting self-repair process of the skin. It gives 24 hours protection as it can be used as a day-night cream for your sensitive skin. The Sebamed Moisturizing Face Cream is specially prepared to keep in mind the necessity and quality of sensitive skin type and according to that, all its ingredients are quite safe. This is hypoallergenic that is another important feature of this moisturizer. Its primary ingredients include aqua, glycerin, petrolatum, tocopheryl acetate (Vitamin E), Vitamin D, myreth-3 myristate, Cetearyl alcohol, sodium citrate, fragrance (parfum), Phenoxyethanol, benzyl alcohol, sodium carbomer, sodium citrate, sodium PCA, and dimethicone. Women who have used this moisturizer are very much satisfied with its benefits for their sensitive skin. It has provided relaxation to their skin allergies and also it keeps the skin cool, soft and prevents further allergies. It non-comedogenic feature is another advantage for this special skin type. Give 24 hours skin protection. Cause skin irritation to few users. Its smell is a little bit odd. After going through all the pros, cons and features of this moisturizer cream for sensitive skin we found this lotion is abundant with all the necessary requirements that a sensitive skin needed for its better health and care. So this is recommendable to our readers. 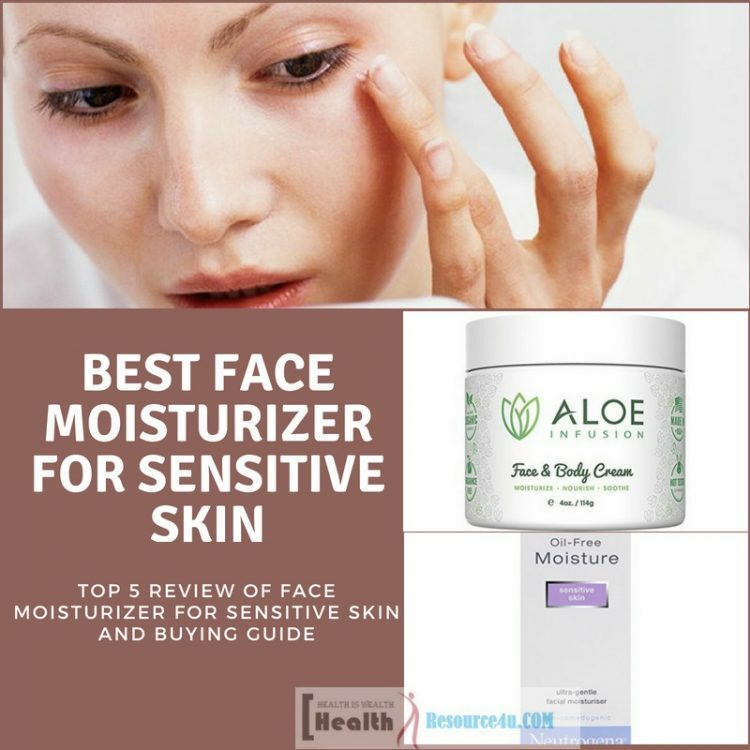 All the products mentioned in this article are good in their own way and one of the best face moisturizer for sensitive skin types. Pick any one of them as you think will be perfect for you.